The boyfriend of a teenager who had her leg amputated after The Smiler ride crash said Alton Towers should have known there was something wrong with the ride. Joe Pugh, who was on the rollercoaster with his girlfriend, Leah Washington, at Alton Towers, was giving his views nearly two weeks after the crash that left his knees shattered. A student who suffered life-changing injuries in the Alton Towers rollercoaster crash has had her right leg amputated, her lawyers have said. This morning, my client, Vicky Balch, has had her right leg amputated below the knee. Vicky has had a long and incredibly painful fight to retain her leg. Regrettably, her bravery has not been rewarded. The step was taken to remove the leg following seven bouts of surgery. Further surgery will be required in the immediate future, which may involve a more acute amputation. Ms Balch is the second of the crash victims to lose a limb; Leah Washington had to have her left leg amputated earlier this month. Alton Towers has made its first payouts to the victims of the Smiler crash. Leah Washington, 17, who had to have part of her leg amputated, could receive several million pounds in compensation. Her boyfriend Joe Pugh, 18, shattered both kneecaps in the rollercoaster smash last month. Dancer Victoria Balch, 20, has had extensive surgery for her "life-changing" leg injuries. While her boyfriend Daniel Thorpe suffered a fractured leg and punctured lung. Lawyers representing the victims said the money would help with their "rehabilitation" as well as four others who were also injured. Paul Paxton, Head of Personal Injury at law firm Stewart Law, said: "The families are satisfied that no expense is being spared in the investigation into what caused the accident on the Smiler ride at Alton Towers." He also met with Health and Safety inspectors who said the ride is likely to remain closed for a significant period of time and indeed "may never open again". The boyfriend of a teenager who had her leg amputated after a rollercoaster crash says the theme park should have shut down the ride. Alton Towers has confirmed two of its popular rides - Air and Runaway Train - will be open and operational as usual tomorrow. It comes after the Runaway Train opened late this morning, remaining closed until 11.55am, due to what a theme park spokeswoman said was a "late handover" from the technical services team, who handle all pre-opening checks. Air was closed for 16 minutes while staff took one of the trains off the ride and replaced it with another. The ride was also closed for two to three minutes at a time later in the day after a guest was taken ill, and to confiscate a camera from another visitor. Spokeswoman Liz Greenwood told ITV News that any delays now being experienced were within the usual expected level. It is natural that given the current circumstances, our guests are more focused on any minor delay or technical stoppage, but all of the rides undergo comprehensive pre-opening checks and any delays that we are experiencing now are within our expected level. All issues will be dealt with according to our stringent processes and rides will reopen as appropriate. The Mine Train didn’t close once it had opened and Air was closed for a maximum of 16minutes. Both rides will run tomorrow as usual. Two more rollercoasters at Alton Towers have been closed after a large metal clip was feared to have dropped off one of the rides. Air and Runaway Mine Train were reportedly shut just minutes after the Staffordshire theme park opened. Air opened in March 2002 and the Runaway Mine Train, which opened in 1992, is oldest ride at the theme park. Alton Towers confirmed the rides had closed for "technical issues." "All issues will be dealt with according to our stringent processes and rides will reopen as appropriate", a spokeswoman said. Last week, sixteen people were injured after a crash on the Smiler ride. Leah Washington,17, was one of four people who were seriously injured, and had to have her left leg amputated above the knee. 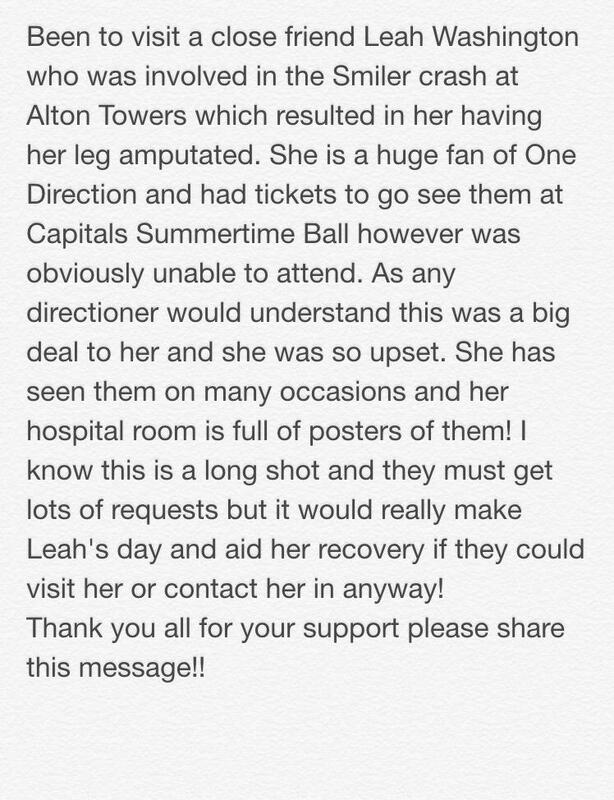 One Direction singer Louis Tomlinson says his thoughts are with 17-year-old Leah Washington who had to have her left leg amputated after last week's crash on the Smiler ride at Alton Towers. A friend of Leah's also took to twitter to try and get the band to visit her in hospital as she continues to recover from surgery. The families of three people injured in The Smiler rollercoaster crash have welcomed the admission of liability from Alton Towers today. Victoria Balch, Leah Washington and Joe Pugh were among those injured in the crash at the theme park last Tuesday. Merlin Entertainments, which owns Alton Towers, today said it accepts full responsibility for the crash and that all those injured will receive compensation. A 17-year-old girl faces months of rehabilitation after losing her left leg above the knee in The Smiler crash at Alton Towers. Leah Washington and boyfriend Joe Pugh were among the 16 injured in the crash at the theme park, which reopened today. Alton Towers has today said it accepts full responsibility for last Tuesday's crash and that all those injured will receive compensation. A friend of Leah Washington has said her injuries will not stop the teenager continuing with her life after it was confirmed the 17-year-old lost her left leg in The Smiler crash at Alton Towers. Alex Ashmore said he was "devastated" for Leah, who has had her left leg amputated above the knee, and her boyfriend Joe Pugh, who suffered two broken knees, after they were involved in the crash on their first date. But he said the injuries wouldn't stop Miss Washington, who he said had been looking at going to university and celebrating her 18th birthday. Alton Towers has said it accepts "full responsibility" for The Smiler rollercoaster crash and will provide compensation for all 16 people injured. Merlin Entertainments, which owns the theme park, said it had written letters which were hand-delivered to the 16 people or to their families. It said compensation claims will be dealt with "swiftly and sensitively". Irrespective of the outcome of the current investigations into the causes of the accident, in these letters we have accepted full responsibility to those who had been injured in the accident and confirmed that we will ensure that compensation will be provided to them. Details of the rides that have been halted and what to do if you have tickets for Alton Towers.